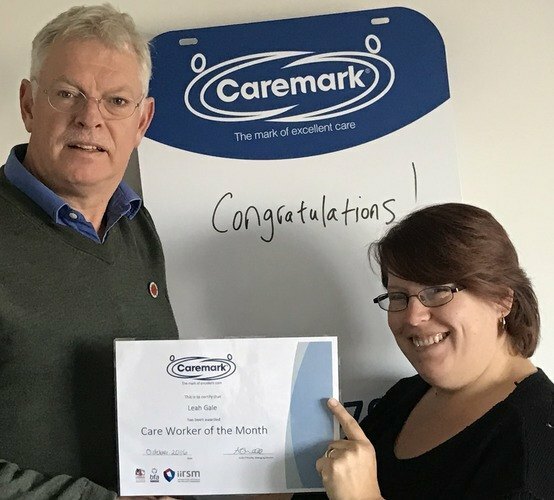 Leah was one of the first Care Workers to join Martin Steyn and his new team and already has set a very high standard of care for others to follow. She fully understands the importance of training and is meticulous in all her record keeping. Leah is always punctual for her calls and completely reliable, making herself available to cover other calls when needed. Her communication is excellent and she always keeps the office informed of anything she feels needs recording. She recently had concerns about a client not eating and informed the office and we were able to communicate with the relatives. On another occasion Leah picked up on a medical appointment for her client (which the office had not been made aware of); she not only informed the office but took the initiative and took her client to the appointment. Leah is a great team player, is always willing to fill in on calls when others are not available at the last minute; supports and helps less experienced carers, giving advice and practical assistance when needed and shadows others without being asked. Her clients say: "She is the best, 100/100!" and comment on her sensitivity and caring skills. Leah's excellent attitude, "Let's get it done" approach and her caring abilities make her a worthy winner. She is a real pleasure to have on board. Well done!